Evaporation from Lake Mead was measured using the eddy-covariance method for the 2-year period starting March 2010 and ending February 2012. When corrected for energy imbalances, annual eddy-covariance evaporation was 2,074 and 1,881 millimeters (81.65 and 74.07 inches), within the range of previous estimates. There was a 9-percent decrease in the evaporation rate and a 10-percent increase in the lake surface area during the second year of the study compared to the first. These offsetting factors resulted in a nearly identical 720 million cubic meters (584,000 acre feet) evaporation volume for both years. Monthly evaporation rates were best correlated with wind speed, vapor pressure difference, and atmospheric stability. Differences between individual monthly evaporation and mean monthly evaporation were as much as 20 percent. Net radiation provided most of the energy available for evaporative processes; however, advected heat from the Colorado River was an important energy source during the second year of the study. Peak evaporation lagged peak net radiation by 2 months because a larger proportion of the net radiation that reaches the lake goes to heating up the water column during the spring and summer months. As most of this stored energy is released, higher evaporation rates are sustained during fall months even though net radiation declines. The release of stored heat also fueled nighttime evaporation, which accounted for 37 percent of total evaporation. The annual energy-balance ratio was 0.90 on average and varied only 0.01 between the 2 years, thus implying that 90 percent of estimated available energy was accounted for by turbulent energy measured using the eddy-covariance method. More than 90 percent of the turbulent-flux source area represented the open-water surface, and 94 percent of 30-minute turbulent-flux measurements originated from wind directions where the fetch ranged from 2,000 to 16,000 meters. Evaporation uncertainties were estimated to be 5 to 7 percent. A secondary evaporation method, the Bowen ratio energy budget method, also was employed to measure evaporation from Lake Mead primarily as a validation of eddy-covariance evaporation measurements at annual timescales. There was good agreement between annual corrected eddy-covariance and Bowen ratio energy budget evaporation estimates, providing strong validation of these two largely independent methods. Annual Bowen ratio energy budget evaporation was 6 and 8 percent greater than eddy-covariance evaporation for the 2 study years, and both methods indicated there was a similar decrease in evaporation from the first to the second year. Both methods produced negative sensible heat fluxes during the same months, and there was a strong correlation between monthly Bowen ratios (R2 = 0.94). The correlation between monthly evaporation (R2 = 0.65), however, was not as strong. Monthly differences in evaporation were attributed primarily to heat storage estimate uncertainty. 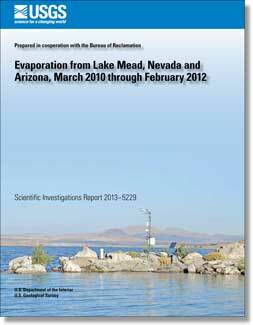 Moreo, M.T., and Swancar, A., 2013, Evaporation from Lake Mead, Nevada and Arizona, March 2010 through February 2012: U.S. Geological Survey Scientific Investigations Report 2013–5229, 40 p., http://dx.doi.org/10.3133/sir20135229.